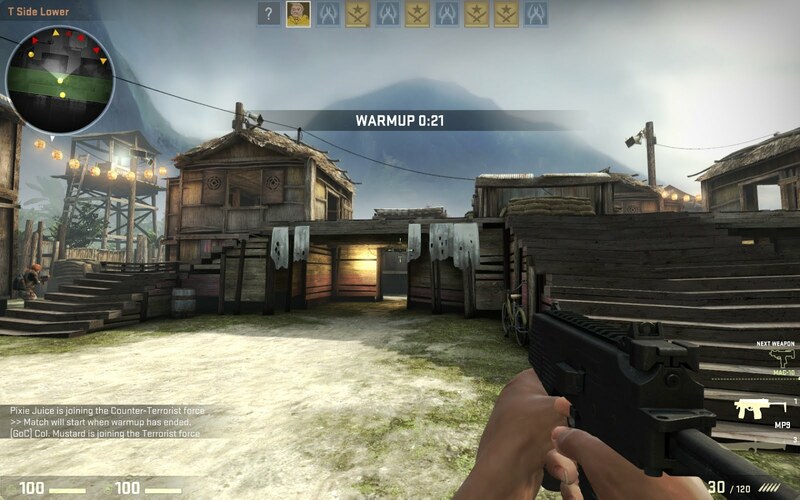 When I originally read up about Counter-Strike: Global Offensive (CS:GO) I knew it was going to be not much more than a re-hash of the Counter-Strike formula: the initial screenshots didn't look too different from Counter-Strike: Source and the game wasn't going to be full price. The game was affordable and since I was curious to see what actually was different between this latest iteration of CS and its predecessors I decided to buy it. CS:GO has pretty much the same gameplay from previous Counter-Strikes. You can either play as a terrorist or counter-terrorist and your goal is to either wipe out all opposition or successfully plant a bomb or rescue hostages (depending on which side you are on). There are a couple of new modes added to the game called Arms Race and Demolition: they are both quite similar in that they disable buying and the player gets a predetermined set of guns to use, except Arms Race is purely Team Deathmatch. "[CS:GO] will be a welcome breath of fresh air for those who are drowning in a sea of unwanted and unnecessary weapon and perk unlocks." 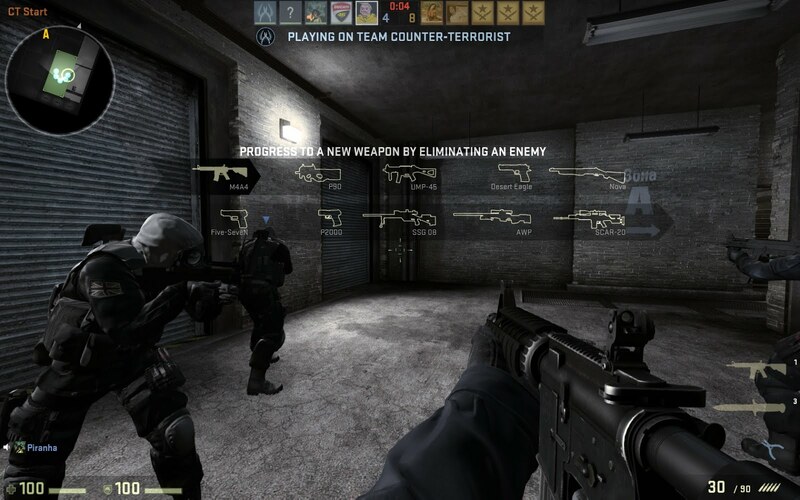 It'll definitely be a shock to Battlefield or Call of Duty players transferring to CS:GO. There are no vehicles, no prone, no weapon unlocks and it's very easy to be killed. This is a back-to-basics FPS which may seem limiting and irk those who have only played contemporary FPSs but it will be a welcome breath of fresh air for those who are drowning in a sea of unwanted and unnecessary weapon and perk unlocks. To one who has some experience with CS but not a fanboy of the series, it doesn't seem like there's much difference on the surface although there appears to be easier to spray if not controlling your fire at least compared to earlier versions of CS. 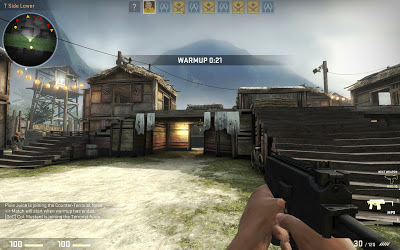 There are however some new weapons such as the PP-Bizon, Negev machine gun and Tec-9 pistol except and new grenades such as Molotov Cocktails. It's also nice to see they've finally licensed the name of the guns so just like CS beta days, the guns have real names again. I believe this is the first CS game to incorporate music into the gameplay, and they do a pretty good job of it. While the music is generic action movie music it actually changes depending on what is happening in the game. For example, when a bomb is planted an added degree of urgency and suspense is present in the music. When compared to contemporary FPSs like Battlefield 3, the graphics aren't terrific only being a slight improvement on CS: Source (and that was released 8 years ago). However, I suspect this was done on purpose to ensure the game ran smoothly on consoles. There's always been good replay value with Counter-Strike as there's always a decent selection of maps and many players frequenting its servers. It's now been enhanced with the addition of Steam achievements and two new game modes (as mentioned earlier) so technically there's even more reason to play. "Only thing that's discouraged me from going back to play? The community." Only thing that's discouraged me from going back to play? The community. I actually used to be quite a big fan of Counter-Strike back in its original format but one episode turned me away from the game as my FPS staple forever: on one particular map I was playing as the terrorists, so I was guarding the hostages – ensuring that the counter-terrorists didn't get their hands on them. There was a lot of heckling from those already dead accusing me of "camping". How could I be "camping" if the whole point was to hold on to the hostages? This wasn't Team Deathmatch (or at least so I thought). Anyway, I ignored the comments as I normally do but what I didn't realise was that one of the hecklers was actually the admin of the server. Turns out he didn't like what I was doing either and banned me for playing the game in what I believed was the correct way. My point is you'll find that most players in CS thinks it's all about your Kill/Death ratio and that the game is not meant to be played in a tactical manner. If you disagree, prepare to be banned as a result. Yes this tends to be the case to some degree in many FPSs but I find it more so in CS since the game isn't that far removed from team deathmatch anyway. So be warned! Also when played against veterans, the game can be quite difficult and not very newbie friendly; more so than other games. If someone has perfect aim with a rifle in Counter-Strike and knows the maps like the back of their hands, you're almost invincible. So if you want to be even competent in CS you have to practise like crazy (or find some n00bs to pick on :))! No bugs as far as I know. Not as if they're making big changes to the formula though. For those wanting a back-to-basics multiplayer shooter or a more polished version of Counter-Strike: Source, CS:GO might be right up your alley. If you're looking for drastic changes over the previous Counter-Strikes or you enjoy unlocking weapon and perk unlocks, then don't bother.